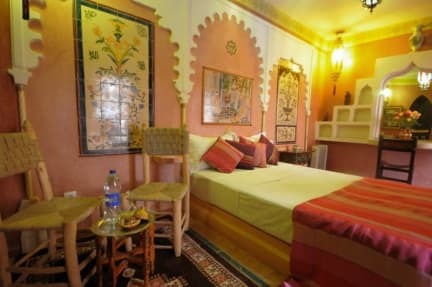 Riad Basma i Marrakech, Marokko: Reservér nu! 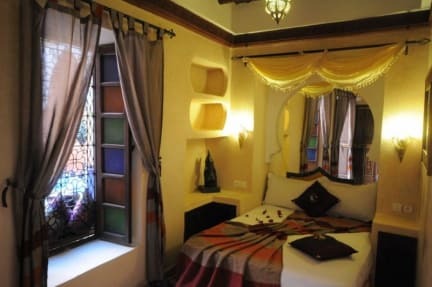 Located at 5-minute walk from Koutoubia Mosque and 2 minutes from Jamaa El Fna Square, Riad Basma is a traditional-style Riad with a patio and a furnished terrace. Guests are invited to the Moroccan-style lounge. The rooms at Riad Basma feature Moroccan Tadelakt and tiled flooring. They have a private bathroom with shower or bathtub, some dispose of a seating area where you can use free Wi-Fi access. A continental breakfast is included in the rate price. Guests can also request a homemade Moroccan meal on from12€/person . Air conditioning is possible in rooms with a supplement of 10€/night. VAT / Sales Tax (10% of the total) and Tourism city taxes (2,20€ person/night) are not included in the room rate. Airport/Bus or train station transfer is available from15€ one way, please contact us to inform about flight details, in case you wont need it please inform about approx arrival time. Please allow 48 hours for cancellations. We require payment for the whole reservation in cash upon arrival.